Last Friday we let you know via our Facebook and Twitter feed that Capital One® has increased the sign up bonus for the IHG® Rewards Club World MasterCard® from Capital One® to 60,000 points from the previous 30,000. This 60,000 bonus points offer could be enough points for up to four reward nights at many Holiday Inn® hotels, but could also be redeemed for even more reward nights if you book via IHG's PointBreaks offers that run at 5,000 points per night. Ironically we just posted the latest PointBreaks list this morning for reward stays until March 31. 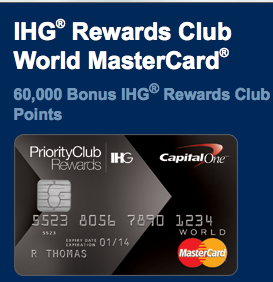 IHG® Rewards Club points never expire and there are no blackout dates for Reward Nights. Plus, customers can reward themselves even faster by combining their points with cash. I know this card was pulled from the affiliate channel quite some time ago with no plans on returning it so chances are you won't see it with cashback unless Cap 1 ups their marketing budget on the card but that is doubtful seeing that they offering double the amount of points which of course costs them more. Yes the current PB list is weak compared to the past few ones but no harm in getting the card now if you want since the points don't expire, that way you'll have those points in your account ready to burn on the first day of the next PB list!